Hello to everyone! I'm a little in love with those SnackTAYku International entries, so I had always wanted to do my own, so when me and my coworkers went out to grab something special to eat I decided to capitalize in this opportunity and talk about a little food of ours; I'm Talking about the Torta. Now, first we need a (not so) little disambiguation since the word Torta means a lot of things depending on the country, normally it refers to a kind of round and flat-shaped bread made without the use of Yeast, but like many words, each country gives them the meaning they want, for example in various countries of Latin America and some European the word Torta is used commonly to refer to sweet cakes (like in birthday cake), or for example Sopaipilla is known as Torta Frita in Argentina and Uruguay. The wikipedia entry for the word talks about two regional variations: The Philippines one (a little parenthesis here just for fun, there is a part of the article that links to something called puto mamon in Philippines which is a very offensive swear where I live) and the Mexican One, which is the one I will be covering. In Mexico a Torta is some kind of sandwich served on an oblong 15 cm firm, crusty white sandwich roll, called a bolillo, telera, or birote. Tortas can be eaten cold or hot, grilled or toasted in a press in the same manner as a cuban sandwich or panini. Garnishes such as avocado, poblano, jalapeño, tomato, and onion are common. The dish is popular throughout Mexico, and is also available anywhere with a large number of Mexican immigrants so you may have heard of it before. Now with that out of the way, let's talk a little about the place we went to visit: Tortas Super Astro. Super Astro is a (former) Lucha Libre wrestler who had the dream of owning his own food bussiness to sell a most beloved dish here in Mexico, the Torta. The place was filled with Lucha Libre paraphernalia. Then he added his own twist to the traditional dish. He had the idea of doing a very special torta, and on top of that throwing a challenge with it. 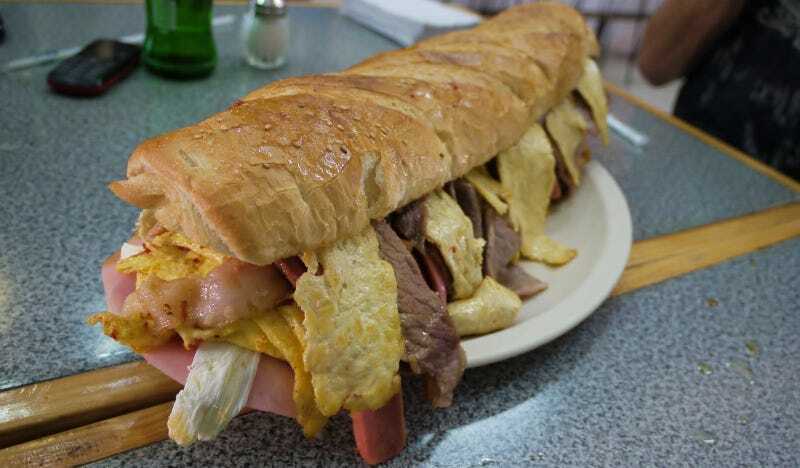 I love the image on top since may confuse some about the size of the dish but here's the real deal: Meet the former "Torta Gladiador"
A Gigantic combination off all the thing you can imagine: Bacon, Cheese, Grilled Chicken, Beef Steak, Eggs, Sausages, Ham and Mexican Chorizo with garnishes like carrots, avocado, onion, jalapeños, tomato and some mayo to boot. The thing was like 20 inches (50 cm) long and weights about 4.5 pounds (2 kg). Now, about the challenge: If you could eat that thing in less than 15 (yes only 15) minutes, it was free! !, and you were immortalized in the Wall of Fame. Many people tried, almost all failed to do it, and it is told that only 3 people were able to clear the challenge, and there is even an urban legend saying one of those was a 12 year old kid. After some familiar and financial troubles, he had to close the original store, but fortunately he recovered and opened up a new store. And that is the one we went to visit. Now there has been some changes, the gargantuan torta is now known as "Torta Super Astro", the place is a little smaller, and instead of the challenge they give you a mask when you buy the Torta but it is still filled with Lucha Libre things. Here's the Menu, that for some reason now is very rudimentary. The prices are in Mexican pesos of course, but you can easily guess that the gigantic torta is the one that cost around 4 more times than the rest. Now, we went as a group of three, so we asked for the torta to be cut in 3 pieces, so you can see the approximate size of each piece and as you can see, it barely fits the screen but was prepared in about 15 or 20 minutes, so it came out actually quite fast, and we didn't had the opportunity to take a picture before it was sliced in half, since the guy with the camera was in the bathroom at the time. It looks a little greasy at the beginning but nothing a napkin can't help and is a little difficult to hold, since the filling is going everywhere. Really, are you supposed to eat thrice that in 15 minutes? I mean that thing is a Heart Attack waiting to happen? but oh well. The torta is way to hard to eat since it barely fits in a normal mouth, so you may want to eat some of the toppings first and then dig into the middle. The best part of all is that despite all the ingredients, it is actually quite tasty, and I specially liked the cheese they used. There was supposed to be more pictures in here, but man the thing required a lot of concentration to eat, and after finishing with it, the last thing we were thinking was taking more pictures, sorry! If you have the opportunity to try this, by all means go ahead and do it, but unless you're a food fighter or have a death wish, you may want to avoid trying to eat it alone.